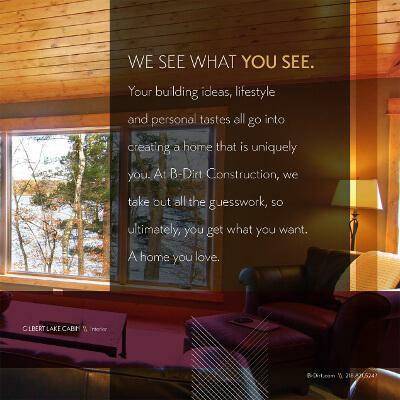 B-Dirt, Brainerd custom home builder, has built a reputation of putting you first. When you decide to build with B-Dirt, you become part of the family. You aren't just building a home, you're building a relationship with us to last! B-Dirt's strong commitment to keeping you within your budget is just one of many ways we strive to earn your business. B-Dirt also has both home designers and home builders right on staff, to customize your dream home to best suit your needs. B-Dirt staff boasts over 25 highly-skilled employees to offer you the best possible project utilizing the best tools and ideas. You will always get the very best products and service with B-Dirt. Call (218) 821-5243 today and start building your relationship with B-Dirt. You'll be so thrilled you did! 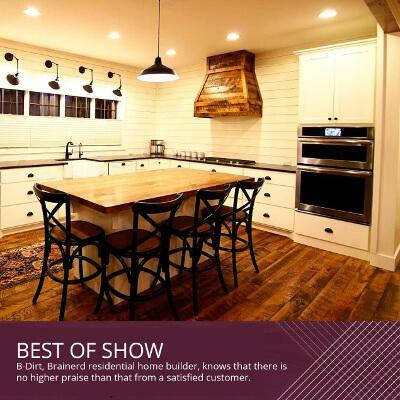 B-Dirt isn't like any other custom home builder. Our unique name, coined by the young son of one of our B-Dirt founders, is just the start. 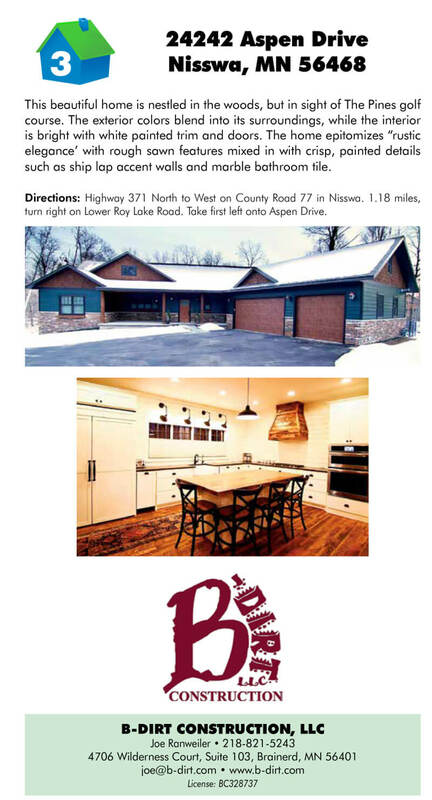 Whether you are looking to build in Brainerd, Crosslake, Baxter, Gull Lake, or any of the surrounding areas, experience the B-Dirt difference. From your free consultation using the latest CAD 3D software to visualize your project, to superior materials and energy-saving efficiencies, B-Dirt's team of professionals have years of experience perfecting their craft. What's more, while your dream home is being built, we can put you up in a town home for free. That's the B-Dirt difference. Call (218) 821-5243 today and become part of the B-Dirt family! This beautiful home is nestled in the woods, but in sight of The Pines golf course. The exterior colors blend into its surroundings, while the interior is bright with white painted trim and doors. The home epitomizes “rustic elegance’ with rough sawn features mixed in with crisp, painted details such as ship lap accent walls and marble bathroom tile. Directions: Highway 371 North to West on County Road 77 in Nisswa. 1.18 miles, turn right on Lower Roy Lake Road. Take first left onto Aspen Drive. 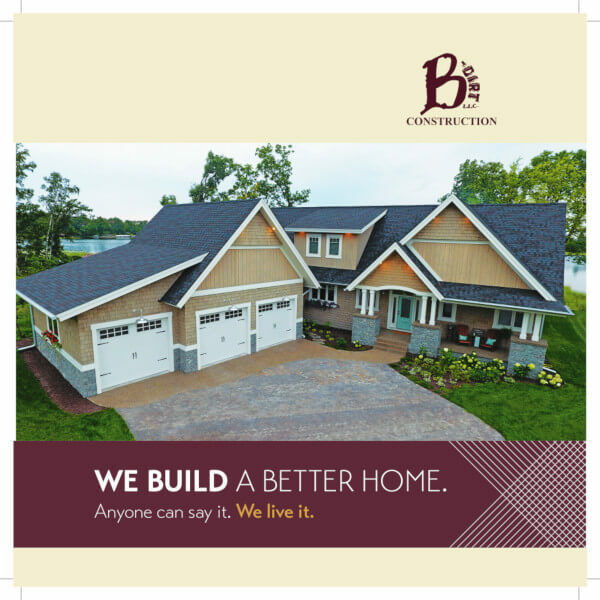 B-Dirt, Crosslake custom home builder, invites you to come visit the Spring Lakes Area Home Tour at 24242 Aspen Drive, Nisswa, MN 56468. 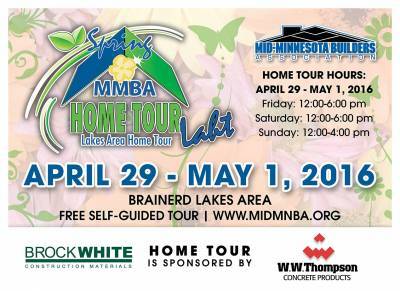 This home tour is an annual event sponsored by MMBA (Mid-Minnesota Builders Association), and you won't want to miss this exquisite B-Dirt model home! This beautiful home is nestled in the woods, but in sight of The Pines golf course. The exterior colors blend into its surroundings, while the interior is bright with painted trim and doors. The home epitomizes "rustic elegance," with rough-sawn features mixed in with crisp, painted details such as ship lap accent walls and marble bathroom tile. B-Dirt knows that seeing is believing. Nothing gives you a better idea of what we do than to come and walk through a finished product! Come on out and have a look today. We promise it will be worth the trip! Take Highway 371 North to West on Country Road 77 in Nisswa. Go down 1.18 miles and turn right on Lower Roy Lake Road. Take your first left onto Aspen Drive. We look forward to hearing from you! When you work with B-Dirt Construction, you’ll soon realize that you’re in a relationship—with all of us. 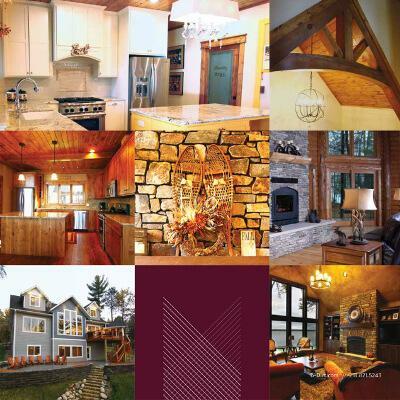 We have over 25 highly-skilled employees that build our custom homes. From roof to foundation, every detail is made with outstanding craftsmanship. But before you get that far, we’ll provide a preliminary design and price total, all at no cost to you. If you need a place to live while B-Dirt Construction is building your home —we’ll set you up in a townhome, for free, until your project is complete. And now you know why we’re different. It’s because we care, not only about your project, but also about you. Your building ideas, lifestyle and personal tastes all go into creating a home that is uniquely you. At B-Dirt Construction, we take all of those components and project them for you in a visual way. Utilizing the latest 3-D software, we can make your vision come to life, before lifting a single board. Changing interiors and exteriors, colors and materials, all help refine your home. We take out the guesswork, so ultimately, you get what you want. How we build our homes is key to our success. Here are just a few ways B-Dirt Construction stands apart from other builders. Many builders in northern Minnesota use block or poured cement basements. These methods can leak, and are not energy efficient. B-Dirt Construction uses Insulating Concrete Forms (ICF). These are interlocking modular units that are dry-stacked and filled with concrete. We add pre-engineered rebar to the ICFs to reinforce their strength. The forms are left in place which increases efficiency and makes your basement warm and inviting. Another B-Dirt Construction difference is that we use blown-in blanket insulation in our walls, not R-19 fiberglass batting. This not only provides an R-24 value, but it fills in all the hard-toreach areas in the wall cavity. We go to the trouble of insulating your home—really well. So why not heat it equally as well? B-Dirt Construction installs dual-heat systems that allow you to not only switch between gas or electric, but you also receive lower kilowatt rates at most local utilities. You know that your home will be well built, well insulated, and well heated. Finally, put your mind at ease knowing that its exterior is also of the best quality. James Hardie cement board siding has won numerous awards for it’s durability. It is resistant to rain, wind, snow, sun and hail. Only the best for B-Dirt Construction clients. B-Dirt (Crosslake custom home builder) had a recent query from a prospective client concerning a future retirement property. He currently lives in Iowa, and eventually would like to build a retirement home on a piece of property he will one day inherit in Clearwater. He wondered about the logistics of building a home while not in the area and able to check on it regularly. He asked if this was even feasible to think about so many years in advance. Not only is B-Dirt able to discuss and help you plan years in advance, we have done so regularly! We offer ideas and designs that will lead you to the best decision on the timing and cost of your eventual retirement home. 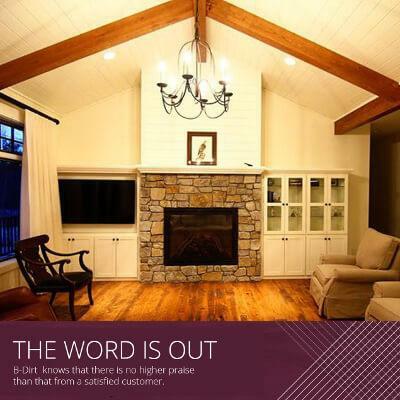 B Dirt recommends coming in to meet with us face-to-face for about an hour to discuss what type of home you are looking for and how you plan to use it: will it be a seasonal or year-round residence? We will discuss how we can manage your project from a distance. We do this frequently, as many of our customers are out of the area at the time of construction. Another option we offer is free townhouse rental as your property is being built, if you decide to wait until you retire to move up here. We look forward to making your dream a reality...no matter how far in the future it is! Call B-Dirt today at 218-821-5243 and discover why our reputation precedes us! B-Dirt Construction is like no other construction company. We pride ourselves on not just building homes, but building relationships with all our customers. 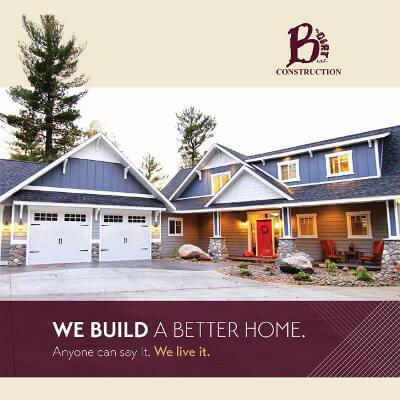 From your very first no-cost, no-obligation consultation, until the finishing touches are put on your dream home, B-Dirt, Brainerd's leading construction company, is making you part of our growing family. We are always available for any questions you may have. B-Dirt will also send you weekly reports on our progress as our construction is being completed. If we are building you a new home, we will even put your family up in a townhome at no cost until construction is complete. Call 218-821-5243 today, and build a foundation with B-Dirt!